The Billy is a scenthound that was developed in France. 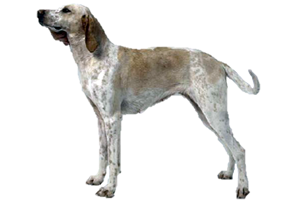 It is a ‘Chien d’Ordre’ or one of the French hounds bred to hunt large prey such as deer and boar. They are trained ‘Chasse-a-Courre’, meaning they kill the animal instead of chasing it back to the hunter. ​Today, the Billy remains a pack hound and is never seen outside of France. The Billy is named after the Chateau de Billy in the Poitou region of France. It was developed in 1877 by Gaston Hublot de Rivault. He crossed the Céris, Montemboeuf, and Larye, which are now extinct. He desired a pale hound with French blood, capable of hunting large prey. By the early 1900s the Billy was firmly established and had been dispersed throughout France. Unfortunately, both World Wars were devastating for European breeds, and the Billy suffered greatly. Few dogs remained, and although the son of their creator, Anthony de Rivault took up their cause he could only find a handful of pure Billys remaining. Through careful breeding (it is thought Poitevins, Porcelaines and Harriers were introduced) he prevented their extinction. Today the Billy is firmly established inside of France, still pursuing deer and boar. However, it is not found outside of its homeland and this is not likely to change in the future. Is the Billy Right for You?